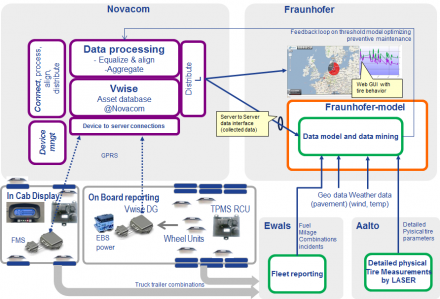 Novacom Europe, a joint venture of GE Equipment Services Europe and Novacom Services, is a Telematics Service Provider for mobile assets with a main focus on the European transport and logistics industry. Novacom�?Ys customer-centric telematics solutions provide vital information to clients about asset location, status, and serviceability by offering the most reliable and well-protected services in real time for both perishable and non-perishable commodities. 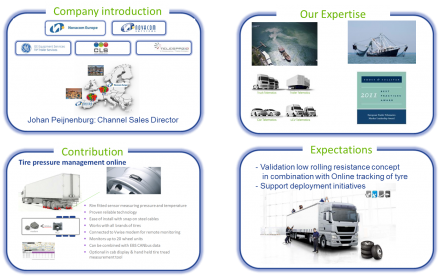 Combining the expertise on vehicles, services and data acquisition expertise of the shareholders (TIP Trailer Services & CLS) and their industry leading partners, Novacom Europe delivers scalable full service solutions that create true customer value . The Vwise service contains a variety of value added services optimized for specific market segment and is recognized industry leaders on the basis of quality, content and innovation. The Vwise Telematics solutions not only enhance the transport and logistics user�?Ys experience but also ensure the competitiveness of the European industries. Novacom Europe was rewarded in 2011 by Frost & Sullivan on Market Share Leadership (Trailer Telematics Europe, 2011). Main activities and references / Role in the project Novacom�?Ys state of the art DG100 telematics system and related sensors, will filter any anomalies and ensure false alarms and measurement errors to prevent wrong data deliveries. Novacom�?Ys data collection and data distribution systems (located at its data centre in Toulouse, France) provide day-today telematics data deliveries to customers such as Schenker, TNT, Airbus, Gefco, EDF, Veolia, Cargoline, Sita, DFDS, Deutch Leasing, Modalis, Suez, Visbeen, or DHL. Novacom will use its existing European wide support network in case any unforeseen corrective maintenance is necessary on the operation of the telematics/TPMS/FMS/EBS test equipment mounted on the vehicles. Central data storage and securing data distribution is performed by its premises in Toulouse. Having proved to be successful with the fully product and service integration of tyre pressure monitoring systems (Siemens VDO, LDL- Technologies) and related proven concepts, Novacom includes the tyre, driver and vehicle related data in its datafeeds and reportings toward the back office systems of 3rd parties. Having proved being able to integrate products and services from a variety of manufacturers Novacom�?Ys role as a project leader to integrate, on vehicle level (FMS-truck and EBS-trailer) systems and on back office level (through Fraunhofer model), matches as both its leading developer capacity and its ability to bring the service available on the road towards the users (fleet operators and data model owners collecting vehicle and tyre data). Apart from the integrating of the products and services, Novacom will install and verify the equipment on the test vehicles (trucks and trailers) and will monitor the proper operation of the equipment during the use by both remote system surveillance and periodic physical testing/validation of the equipment (sensors and system mounted onto the vehicles). This full scale road testing phase will be monitored by Novacom, which will adapt and install measuring sensors in order to collect all data of a fully instrumented fleet campaign test. The developed concept tyres will be run in configurations to have a conclusive feedback on the new tyre and material design features. Ewals Cargo Care as fleet operator will assure a large scale EU road coverage by privileged routes and the related road infrastructural information will be provided by BRRC and Aalto. ITWM will be responsible for the compatibility of data acquisition for the integration in WP5.